A site in China contains 190-million-year old organic remains from non-avian dinosaurs and dinosaur embryos, and some of the world’s oldest known eggshells, according to a new study. 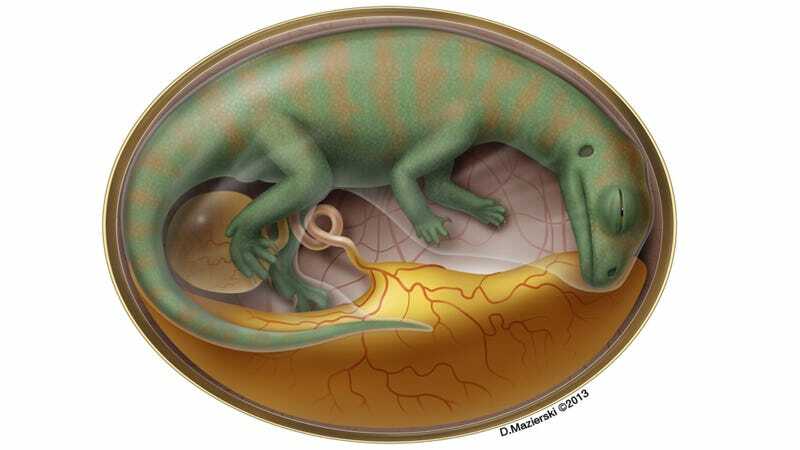 The study, published in the journal Nature, reveals for the first time how dinosaur embryos grew, developed and moved around within their eggs. The organic remains — collagen discovered in bone — also fuel hopes that many mysteries about dinosaurs may be resolved in the not-too-distant future. “Finding remnants of complex proteins in a 190-million-year-old fossil provides great promise for finding it in other extinct animals, if our targeted method is used,” added Reisz, a University of Mississauga paleontologist. Reisz and his team recovered all of the remains at the world’s oldest known dinosaur embryo bone-bed, located near the city of Lufeng in Yunnan, China. The study focused on upper hind limb bones from 20 embryonic individuals of the giant herbivorous long-necked dinosaur Lufengosaurus, which was common to the area during the Jurassic period. The bones showed very rapid growth, doubling in length within the eggs. This indicates that Lufengosaurus had a very short incubation period. The bones were also reshaped, even as they were in the shell, contracting and pulling on the hard bone tissue. Lufengosaurus, like many sauropods and their ancient relatives, grew to enormous sizes and spent their days feasting on large amounts of plant material. Given the new research, it is possible that all such dinosaurs started their growth spurts early, even before emerging into the world, but further analysis is required. No embryos have been found for iconic carnivorous dinosaurs, like T. rex. While the discovered collagen is not technically “alive,” it was derived from what once were the dinosaur’s living tissues. “However, resurrecting a dinosaur is out of the question,” he added, reminding that living birds are dinosaurs. Bringing a Jurassic animal into the present could therefore be a disaster, probably worse than what some movies have fictionally predicted. At the very least, such an animal — if it wound up in the wild — could wreck havoc on the existing ecosystem. David Evans, curator of vertebrate paleontology at the Royal Ontario Museum’s Department of Natural History, echoed Sander’s view. “The early life history of most dinosaurs is poorly documented, and the fossil record of dinosaur embryos is particularly scant in the Triassic and Jurassic periods,” Evans said. This post originally appeared on Discovery News. It has been republished with permission.